In a few days, everyone would be celebrating Halloween, the scariest day of the year where you can merely enjoy everything scary. If other shops will go out of their way to make their shop look appropriate for the occasion, you should too as well. Just because you’re selling jewelry doesn’t make it harder to decorate your store or booth. In fact, by using these jewelry display ideas, you can easily turn your store into one Halloween party. First of all, if you don’t have all the time to make creative Halloween decorations, then your best bet at turning your store into a Halloween pad is by buying plastic decorations, instead. While this could hinder your creative thinking cap, it could also save you a lot of time thinking of possible decorations and creating embellishments for your store. Simply go to the nearest store, buy a few decorations like spiders, bats, Scare Face masks, even scarecrows to decorate around your jewelry store. Don’t worry, these decorations are made to be hung or put conveniently in some place so you don’t have to drill holes or punch nails into your walls. Plastic skeletons can be pretty useful for Halloween. Buy a whole skeleton from any store and use this to display your jewelry. Yes, instead of your usual display equipment, change up your whole theme into something scarier – the skeletons! Besides, those skeleton hands are really cute if you display huge rings on them. You can also use those glow in the dark hands too. Display on a dark backdrop and you have a successful ring display. If plastic skeletons are not enough, you can also consider using spider webs. Spider webs are pretty easy to put up, even if you don’t buy those plastic ones in the shop. Alternatively, you can also use cheese strings which are easy to handle, delicious and they make a pretty convincing spider web. However, if you have plans to use these spider webs as display equipment, you can use wires instead. It will take a little creativity to build your own spider web, but once you have, you can use it to hang bracelets or rings. Now, instead of using the common paper bags when you make a sale, you can buy some plastic jack-o-lanterns to store the jewelry they bought. Not only is this a creative alternative to the usual paper bags, the customers will also appreciate the Halloween gesture. Do you have plans to travel with your jewelry? If you have plans to take your jewelry out in the next few months, then you better start preparing yourself for the expenses and protection for your jewelry. Traveling with your jewelry is not a simple matter. If you want to arrive in your destination with your jewelry in good condition, then you have to find ways to ensure that they are protected from any scratches along the way. One of the best ways to make this happen is to buy a travel organizer for jewelry. However, because there are many different types of travel organizers, you might not know which one you should choose. Here’s a guide on choosing from the different types of travel organizers. 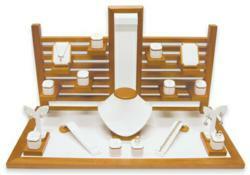 This type of travel organizer can be used for those who have a limited collection of jewelry. A presentation folder is just a two part, folder-like organizer with its own slots and pockets to place the jewelry. Because it has limited space, you can’t put too much jewelry inside. Otherwise, you need to buy more than one presentation folder for your jewelry. If you plan to take on more jewelry than it’ll fit inside a presentation folder, then a jewelry roll could be your best travel organizer. While it’s not the ideal type of jewelry display equipment, it’ll help you to protect the jewelry you have. Even more so, you can add more than the usual amount of jewelry into one case. Unfortunately, because you tend to “roll” the jewelry, it can increase the risk of scratches on them. Choose a jewelry roll with thick material so it can prevent the jewelry from bumping into one another. The ideal form of traveling for jewelry salesmen is through a car. They can easily put the jewelry in the back and drive to their destination. However, if you happen to be commuting to your destination, an attaché case is the ideal travel organizer. Why? Unlike a presentation folder or a jewelry roll, you can put more jewelry inside an attaché case. And it’ll also be easier for you to hold onto it while you travel to your destination. But if you need to pack up all of your jewelry to attend a trade show somewhere, a carrying case is your best bet. Carrying cases are big, some even with its own levels and tiers for each type of jewelry. You can easily set your jewelry into the organizer without having to worry about its safety. A carrying case is appropriate because you can choose from a hard case to a soft case. You can even pick one with its own handle so you won’t have a hard time carrying it around. Always remember to pick the type of travel organizer for your necklace display bust you need depending on your long term requirements. Creating a successful display for your jewelry is never easy. You need to be creative and sometimes, spontaneous and risky, especially when it comes to trying new strategies. In order to be able to sell your jewelry well to your customers, it is essential to try different things that will make your jewelry stand out. A successful jewelry display is hard to make because it has to be a lively background to your jewelry. If it overshadows the jewelry you’re displaying, then it’ll only lessen the chances of people noticing the jewelry you’re selling. Yes, they’ll find your display equipment amusing. But all in all, they won’t be interested in the things you sell. To help you improve your skills in displaying jewelry, here are a few tips you can use. Uniformity is a very attractive factor for any jewelry. If you happen to be selling any collection of jewelry that looks nice and has potential to be sold well, then you can take advantage of it and place them all together in one display equipment. If you have set up a set of strings or wire over your booth, you can set them up to be display together. If you have a tiered platform, you can also use this to display the collection. Once the customer sees that the jewelry is pretty, they’ll immediately want the item that will look most compelling to them. If you display the collection together, they won’t have a hard time comparing it with different colors. From afar, they can already tell which color stands out the most. One of the best ways to play up a feature of a piece of jewelry is to use its background. If a piece of jewelry has a background that can highlight its features, then you should use this for your display. For example, you can use different types of cloth for its backdrop. But don’t just focus on regular cloth. Play up different cloths, depending on the type of jewelry. If you’ll be displaying a one-colored item, you can use an elegant fabric to highlight its colors. Consider using silk or any other shiny material to highlight the jewelry. Jewelry always looks best if they are put together with the things that they look good on. For example, a black platform is the ideal necklace display for a colorful necklace. Why? It is simply because the plain, black background allows the colorful necklace to stand out. In a person’s view, all they can see is the colorful jewelry. And that’s a good way to boost jewelry’s appearance. Do this for all of your pieces and you have a successful display for your jewelry. When you come across an amazing opportunity to sell at a trade show somewhere, you shouldn't hesitate to take it. Even if it means you need to travel a few hours just to get to the place, the opportunity to sell could be good for your business. Unfortunately, this also means that you have to travel with your jewelry and necklace display stands. Still, you should definitely take the risk. Besides, there are many ways to get your jewelry to the location safely. In order to prevent anything from happening to your jewelry during the ride to the trade show, here’s how you can pack them safely. Before anything else, the first thing that you should do is to create a record of your jewelry. Check each of them, one by one and examine them. Make sure to take notes if you have to. Double check the count for each type of jewelry and ensure that you take note of their current condition. If they are in perfect condition now, they should be in the same condition after your travel. Don’t forget to check your jewelry display too. You’ll need them during the trade show and you can’t afford to have them broken during the trip. It’s time to start packing. But this doesn't just mean you throw the jewelry all into one bag. It means you need to sort them out first. Which jewelry will be okay if you put them in one box? You should set a limit too. There should only be 3-5 pieces of jewelry in one box. Use different boxes for every type of jewelry. Place cushions inside the box if you need to protect them from any scratches along the way. Use fabric too if you need to. Double protect your jewelry by placing them in a travel organizer. Travel organizers are pretty convenient and they can help protect your jewelry during the trip. Sometimes, if your travel organizer has its own pockets and slits for the jewelry, you can place them inside without the boxes. Otherwise, the travel organizer can serve as the second box for the jewelry. Now that you have wrapped up your jewelry well, all you have to do is drive carefully to the location. Be careful with humps and swerves so that your jewelry won’t have to wobble around too much. Do remember to check your jewelry again when you arrive. Hopefully, with your means of protection, none of the jewelry got bruised while traveling. It can be hard to sell jewelry in a trade show expo. There are so many other jewelry booths that you need to find a way to stand out above all of them. Besides selling good jewelry, you can also use these 3 techniques to help you sell your jewelry faster. 1. Use attractive jewelry display – no one will disagree with you that a good jewelry display can actually help you sell more. If your display is organized and attractive, you’ll be able to attract more people to your booth. On the other hand, if you keep your display messy, customers won’t be able to find what they’re looking for. A cluttered display will also attract dust so your jewelry will likely be affected if you don’t regulate maintenance and cleaning for your pieces. Besides maintaining an attractive display, you should also use display equipment to create elevation, classify pieces and put together similar pieces of jewelry. If you can’t make your own display equipment, you can always buy assorted types of display from popular wholesale shops. 2. Color-coordinate jewelry – there’s just something about jewelry when you color coordinate them. Sometimes, the more a person sees a color, the more they are attracted to it. If you put all of your jewelry in a display where red necklace are with red rings, then you give your customers a chance to see the type of jewelry they want in an easier manner. Besides, if they already have a specific outfit in mind, they probably already have a specific color of accessory planned out as well. Unfortunately, color coordinating jewelry can be a little hard, especially if you don’t have a balanced amount of jewelry per color. 3. Ride on a celebrity’s fame – everybody has a celebrity they adore. If you use a celebrity’s jewelry style to create your own pieces, you can let people know this by posting pictures of celebrities wearing a similar jewelry. Once the customer sees that your jewelry is similar to the one worn by their favorite celebrity, they’ll definitely be interested in buying it. Of course, this means that you’ll have to get several inspirations for your jewelry. But if you’ll be targeting the fans of a celebrity, it’ll be worth the effort. Sometimes, jewelry makers are the ones who built jewelry shops for themselves. Other times, it is the jewelry shop owner who decides to try their own streak at creativity. When this happens, they’ll need a little more than creativity to make their own jewelry. Here are a few things every jewelry maker should have first before making their own necklace. 1. Main object – this is the most important part of the jewelry. If you design your own pieces, this is the part of the jewelry which will capture the eye of the customer, aside from unique necklace display. For beginner jewelry makers, this could be the beads or the pearls that highly make up any piece of jewelry. Others who have a different idea of how they can make their jewelry can create their own pendant, or buy one from a local crafts store. You can also look for a gemstone, if you were hoping to make jewelry with birthstones. 2. Wire or cord – now the next most important part of jewelry making is the wire or cord which will be used to string together your pendants and other parts of the jewelry. The quality of your necklace highly depends on the wire or cord that you choose. If your chosen string happens to break easily, you can lose all of your beads and you may have to start over. Otherwise, you can also choose chains for your necklace. Unfortunately, chains are harder to hide so you need to pick a good chain that you can actually be seen wearing. The chain can get tarnished easily too. 3. Findings – these allow you to close your necklace around your neck. It is important to find one that will look suitable for your necklace. There are many different types of findings so you can choose which one will match the type of necklace you’re wearing. 4. Pliers – if you’ll be making a complicated type of necklace with all the pearls and beads, you’ll need pliers to manipulate the wire or cord. These cannot be easily warped to your favored shape so you’ll need the help of metal equipment. Pliers will help you wrap the wire around beads and ensure the safety of your main objects. Special pliers for jewelry can be also bought at jewelry display shops. 5. Tweezers – creating a beaded necklace can be pretty hard if you have big fingers. The only way this is possible is if you decide to use a loupe and a magnifier to help you string the beads. Otherwise, tweezers really help to handle the beads while making the necklace. As a jewelry seller, it’s not just the jewelry display that you need to worry about. In fact, you also have to worry about how to sell your jewelry and how you can sell them to your customers. One of the best ways you can sell to your customers is to know your jewelry well. It’s not just about helping your customer choose a piece of jewelry – it’s about letting them know what will look good on them. And for important days, they need to know what kind of accessories they should wear. Job interviews have to be formal and elegant. You can’t be too elegant or you’ll overshadow your boss. But you can’t be too casual or your boss won’t take you seriously. When it comes to dressing up for a job interview, you need to keep it simple, but classy. Wear blazers and formal blouses. These are common for job interviews. When it comes to your accessories, pick the pearl strands in your necklace display box. But don’t overdo it though. Don’t wear too many pearls or you’ll end up looking trashy. Wear a simple, pearl necklace and a pair of pearl earrings. You’ll look elegant and simple, just enough to impress any boss. Beach events are easier to dress up in. You can wear almost anything and no one would really care. But seriously, don’t wear studs to a beach. If you lose them, you’ll never find them again. Avoid wearing anything pearl in a beach event. Pearls are too serious and if you wear them and they break, you lose every pearl that you have. Wear beads instead. Beads are the informal version of pearls and they make you look ready to party. You can wear chains, but if you’ll be wearing accessories made out of cloth, you might want to avoid the waters. If you wet a cloth accessory, you’ll end up ruining it. Formal events have stricter rules than in job interviews. You’re there to have fun but look elegant still. If you wear pearls, you’ll look like you’re going in for a job interview. If you wear beads, you might be out-shined by every other girl in the room. However, if you go for silver accessories, you’re just in the right place. Silver necklaces, silver earrings are great for formal events. They are elegant, simple and they won’t make you look trashy. Now that you have an idea of what accessories to wear, tell your customers this when they ask you. Show them the accessories that will make them look at their best during their event. The more helpful you are, the better for your jewelry shop. When it comes to running a jewelry shop, you have to be creative in order to sell well to your customers. There are so many different jewelry shops nowadays that people have a hard time finding loyalty in one shop. They prefer different shops instead to match their styles. However, if you truly want to make customers loyal to your shop, you need to up your selling strategy and creative and unique jewelry displays. Here are 5 tips you can use to impressing your customers. 1. Interesting jewelry display – having engaging display equipment can help attract customers. If you creatively display your jewelry using earring display trays, necklace display busts, risers and towers, you can easily get people to look at the jewelry you’re selling. Sometimes if your display is too random or messy, you end up confusing customers and they can’t make a connection with the jewelry they want. If you can bridge the connection between customers and jewelry, you can easily captivate their attention and make them want to buy your pieces. 2. Be knowledgeable about the products – when you sell to your customers, you need to know some facts about the products. Where did the products come from? What materials were used to make them? Are they authentic? What country did they come from? Some customers will ask this, especially if you’re selling silver or gold. You need to be prepared to answer them. It’s embarrassing if they ask a question and you can’t answer it because you didn’t make the effort to learn about your products. 3. Know your colors – some customers just don’t know what colors look good on them. You might want to read some tips on how to know which colors look good on people. Don’t just point and refer, be open and even offer a reason why a type of color looks good on them. If they can get fashion advice from you, they’ll know you’re the expert. 4. Be honest – sometimes, people can smell if you’re only helping or helping to sell. If you only help because you want to make a sale, they might be turned off. Genuinely help them to pick out the right accessories and they will come back for more. 5. Offer variety – people like a shop with a lot of things to sell. If you sell only limited pieces, they’ll find the things they want in another shop. Offer lots of jewelry to your customers so they can choose between pieces and try on various styles before they choose. The more you can offer them, the more they’ll come back to you.